With the flight manifested I decided to celebrate the completion and submission of the Test Equipment Data Package with converting the mission art into a patch. There is a long history in aerospace of having patches associated with projects. The projects contain a visual symbolism that helps build the team and provides a visual shortcut to the essentials of the project. 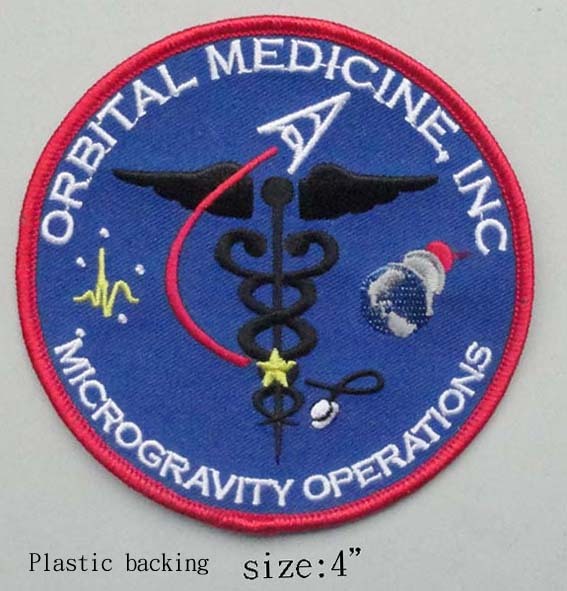 The Orbital Medicine patch shows a black caduceus on a blue background. The caduceus is a commonly recognized symbol of the medical profession. The blue background represents the sky, and the black of the caduceus represents the darkness of space. It is surrounded by the company name and the phrase “Microgravity Operations” in reference to the zero gravity research done by the company. To the right are icons representing the Earth, Moon, and Mars in a receding arrangement. This symbolizes the current and future targets for human spaceflight, and the areas in which space medicine will provide the support for human exploration. At the bottom right of the caduceus is a stethoscope head, which curls into the exhaust of the stylized space ship launching to the top of the patch. The combining of the stethoscope and exhaust plume represent the ground based medical operations performed in support of flight operations. The gold star in the center of the patch symbolizes the phrase “sic itur ad astra” translated “thus you shall go to the stars”. This phrase originated with the Latin writer Virgil, and comes from his book the Aeneid, book IX line 641. The phrase is commonly used in the space community to represent the dedication and aspirations of those involved in the space program to ensure humanity’s access to space. Stay tuned, and “Ad Astra”! The Orbital Medicine research flight has been manifested and scheduled by NASA. The flight is currently set for May 14-18th 2012 out of Ellington Field in Houston, Texas. This is the inital flight sponsored by the Flight Opportunities Program. The testing will be done in conjunction with the NASA Reduced Gravity Office. Orbital Medicine will be evaluating a chest tube drainage device to determine its effectiveness in the microgravity environment. An educational demonstration will be filmed during the flight. Additional experiments will be done in conjunction with Dr. Greg Kovacs of Stanford University. The inital Test Equipment Data Package has been completed and the experimental hardware is being finalized for the flight. Dr. Cuttino gave a presentation on medical clearance for suborbital spaceflight today at the Next Generation Suborbital Researchers Conference 2012 in Palo Alto, California. The talk covered the aspects of medical clearance, what types of problems could be expected in suborbital spaceflight, and the regulating mechanisms in place by the FAA. The talk was well attended and well received. 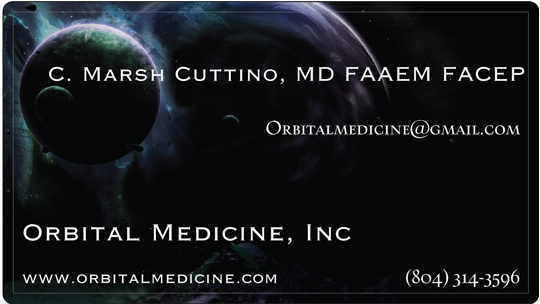 Orbital Medicine, Inc was awarded a NASA Payload Opportunities Grant. 9/21/2011 – Orbital Medicine Founder Dr. Marsh Cuttino will test an experimental design for a chest tube drainage device functional in the microgravity environment. NASA has selected nine proposals to demonstrate new technologies for the second set of payloads to fly on commercial suborbital reusable launch vehicles and the Zero-G commercial parabolic aircraft. NASA is using commercially available vehicles to carry these technology demonstration payloads to help develop the U.S. commercial reusable suborbital transportation industry. NASA’s Flight Opportunities Program provides test flights to demonstrate and validate space technologies on airborne platforms flying above 65,000 feet, the area known as “near space.” The program also supports parabolic flights that simulate brief periods of microgravity or weightlessness.